You like big bikes, and you cannot lie. And the little ones, you can’t deny. You especially love all the parts that make these vehicles run. You want to spend your days as a wrench, repairing hogs. That’s your idea of fun. In other words, you want to be a motorcycle mechanic. Take the mechanic certification practice test. As a motorcycle mechanic, you will use your skills to make sick bikes feel better. Working at a dealership or in a repair shop, you’ll do all types of diagnoses, adjustments, repairs, and overhauls for your customers’ motorcycles. You may have to test drive the motorcycles brought to you for repair, but that’s probably going to be your favorite part of the job. A day in the life of a certified motorcycle mechanic includes discussing the problems and repairs with customers, performing your typical routine maintenance, checking for malfunctioning parts on the motorcycle, repairing or replacing parts, repairing engines, and keeping complete records of the performed repairs. Your certifications will determine what hogs you’re able to work on. Learn about other careers that take six months or less. If you want to make it big in the world of motorcycle mechanics, there are a certain set of soft skills you should have. While some of the qualities listed below can be learned, others can’t. However, don’t let anything discourage you—if being a motorcycle mechanic is what you want to do, you can work on fine-tuning the skills you aren’t strong in. Customer service: You’ll be talking to and dealing with customers who have legit concerns about their motorcycles. And motorcycle owners LOVE their cycles. You need to have proper people skills. Also, because word of mouth is such a powerful promotional tool, the better you treat your customers, the more customers you’ll receive. Attention to details: Motorcycles are made up of many small parts. This means you have to be super diligent when trying to get to the root of a problem. Troubleshooter: Between the equipment you’ll use to check for issues and your quick analytical thinking skills, no problem will be too great for you to fix. Organized: You take it apart; you put it back together. Staying organized is probably a good idea when it comes to being a motorcycle mechanic. Good with your hands: Manual dexterity is a must for success. If you aren’t great with your hands, you’ll find it difficult to do motorcycle repairs. Persistent: Also known as being stubborn, you aren’t giving up for any reason other than the repair simply can’t be done. There are quite a few schools scattered across the U.S. that offer certificate, diploma, or degree programs for motorcycle maintenance. Depending on which program, it will take you a few months to two years to complete your education. You should first have your high school diploma or GED prior to starting your courses. Also, you’ll need to have a valid driver’s license along with a motorcycle endorsement, which you can get at one of your local DMV centers. Certificate: In two to three semesters, you will complete the program and have a certificate allowing you to be a motorcycle mechanic. Your coursework will cover different motorcycles and their systems. Diploma: Diploma programs are usually completed in less than two years. You will learn about motorcycles and their systems, but you’ll also learn about business, management, and customer relations. Associate’s degree: If you want an associate’s degree, you’ll enroll in a motorcycle mechanics program at a community college. You’ll learn about motorcycle engines, electrical systems, fuel systems, welding, troubleshooting, and much more. Along with the educational options, you’ll also need to do an apprenticeship under an experienced motorcycle mechanic’s tutelage. Most likely, you’ll start out doing simple tasks, but as you learn, your hands-on experience will grow along with you. Some motorcycle mechanics learn everything they need to know through a registered apprenticeship. There are so many benefits to finding an apprenticeship: One of which is that it comes with no cost to you. In fact, you learn the trade while making money. Plus, as you gain experience, your salary goes up. So, it’s basically a win-win-win; learn the trade, make money, and have no educational debt. Your state may require you to have an EETC certification in order to work as a motorcycle mechanic, so be certain to check with your local state boards. Even if your state doesn’t have a certification requirement, it’s always a good idea to be certified. It can bring in a larger paycheck and shows a higher level of professionalism. You can also become certified through one of the motorcycle manufacturer’s own certification programs. There are five big motorcycle certification programs. Harley-Davidson: Harley-Davidson partners with a few programs across the nation to better train motorcycle mechanics to work on Harley-Davidson motorcycles. Some schools offering the program are Motorcycle Mechanic Institute and Wyotech. Honda: UTI’s Motorcycle Mechanic Institute also offers a 24-week HonTech training program that will allow you to service all types of Honda motorcycles. This program is only available to motorcycle mechanics with experience. Suzuki: This is a 12-week program called Suzuki FAST, which partners with Suzuki Technical Support to train motorcycle mechanics on all aspects of Suzuki bikes. Kawasaki: Wyotech offers an Asian motorcycle repair certification course which will provide you with the proper skill set to work not only on Kawaski, but Suzuki, Yamaha, and Honda motorcycles. And, Motorcycle Mechanic Institute has a 12-week K-Tech program, which will train you to work in a Kawasaki dealership. Yamaha: There are three levels of certification for Yamaha certification: bronze, silver, and gold. Bronze is for entry-level mechanics, whereas silver and gold go more in depth. Keep in mind, aside from your state’s requirements, additional certifications are voluntary. Motorcycle mechanic work can prove to be seasonal, depending on where you live. During the warmer months, you’ll probably be way busier than 40 hours per week. The median annual salary for motorcycle mechanics is close to $35K. The highest average salaries are over $56K. Realistically, your salary will be dependent on location, the type of shop you work in, your experience level, and if you have certifications allowing you to work on different types of motorcycles. The growth rate for motorcycle mechanics will vary depending on state. However, there has been an increase in motorcycle sales, so this is good news for motorcycle mechanics everywhere. Opportunities will be more plentiful for mechanics who have completed postsecondary education; they’ll be hired before someone without that experience. If it’s motorcycles you love and want to work with and on, then you’ve picked the perfect trade to settle into happily. 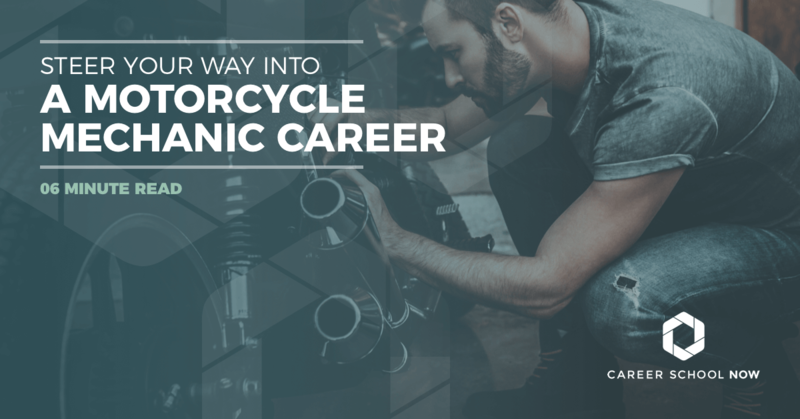 So rev your engine and get rolling into your motorcycle mechanic career. ...Previously What You Need To Know About Apprenticeships Up Next... Is Online College A Good Idea?